ChronoSoft • Classic Gaming on Modern Devices! 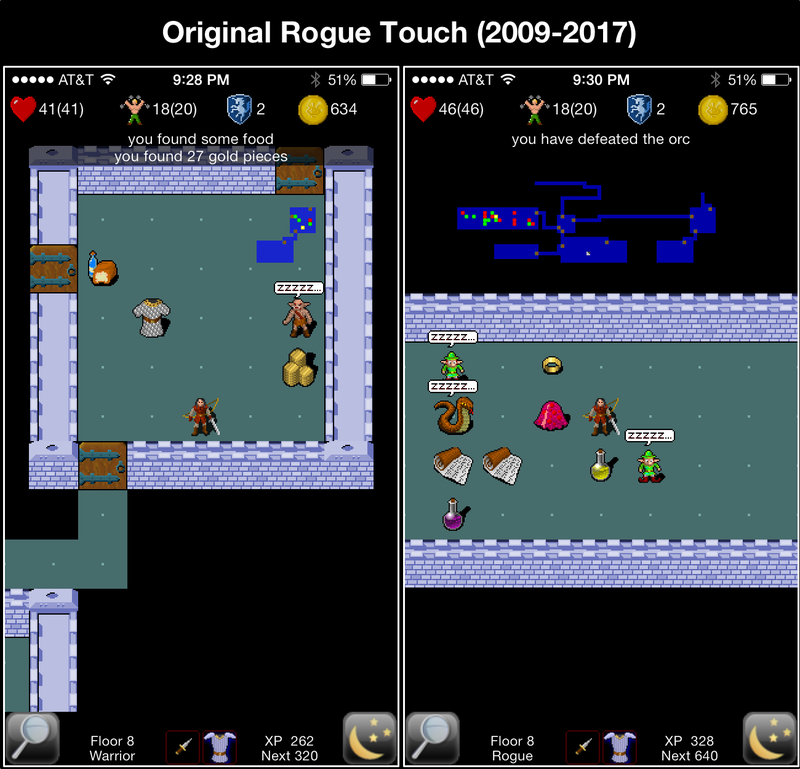 On February 19th 2009, Rogue Touch V1.0 was released. Hard to believe 10 years have passed since then! Never would have guessed back in 2008 when I first started this as hobby-project that it would require so much attention to maintain. Many versions of iOS modified things that RT relied on to function, and of course there have been hardware updates like new phone sizes and screen resolutions. People who write PC-based ASCII roguelikes have the luxury of knowing their code was/will be playable for decades, but a Mobile-based roguelike could end up completely broken once a year by new hardware and software changes. Since then things have been pretty quiet around here. Mainly because 2018 was an incredibly busy year for me, and the first half of 2019 is looking to be the same or worse. I haven’t had time to post here in the blog or in the forums for at least the last 6 months! Was even forced to deactivate new registrations to the forums because there’s no way to manage the unbelievable daily flood of spammers it gets now. Despite all this I wanted to let everyone know I’m still here after all these years, and plan to keep supporting Rogue Touch for as long as I am able. Thank you so much for playing and enjoying Rogue Touch! Posted in ChronoSoft, Rogue Touch, Roguelike | Comments Off on Rogue Touch 10th Anniversary! Apple makes so many changes to iOS annually that developers everywhere must dread the month of September. 2017 is an especially tough year, this fall marks the end of 32-bit support in iOS. I personally am about to lose a bunch of my favorite iPhone games and apps of the last 8+ years due to lack of updates from their creators. Many of you have been justifiably concerned that Rogue Touch would be listed among the casualties of iOS 11. Rogue Touch was originally released on February 19, 2009 and has supported every version of iOS since 2.0 (referred to as iPhone OS back then). It was last updated in September 2013, an eternity ago in the App Store. Sometimes iOS updates only cause performance issues… I’m looking at you iOS 4!!! Sometimes the changes are totally game-breaking as seen with iOS 7, which happens to be the last time RT was updated and saved from oblivion. Today, the 32-bit apocalypse is approaching fast. Rather than simply meet the minimum of 64-bit and iOS 11 support I really wanted to make this update special, so earlier this summer I had a meeting with an artist friend (who is currently working on RT2 artwork) and discussed various ideas for enhancing Rogue Touch. He proposed something more detailed and modern looking but still familiar to longtime players, and created some exciting samples! We crafted a plan, set the budget and timetable, and got started. Despite the number of images to re-create in a hurry, I think he had the easier end of things. Dusting off the Rogue Touch source code I discovered the lurking horror of 600+ deprecations of various functions used within that had occured over the years! Pulling on one thing unraveled multiple other issues. It felt like fighting a Hydra with a rusty dagger. The technical details may be worthy of a separate post! In the end, about 30% of the Rogue Touch codebase has been modified. Way more than planned, but the results are pretty cool. 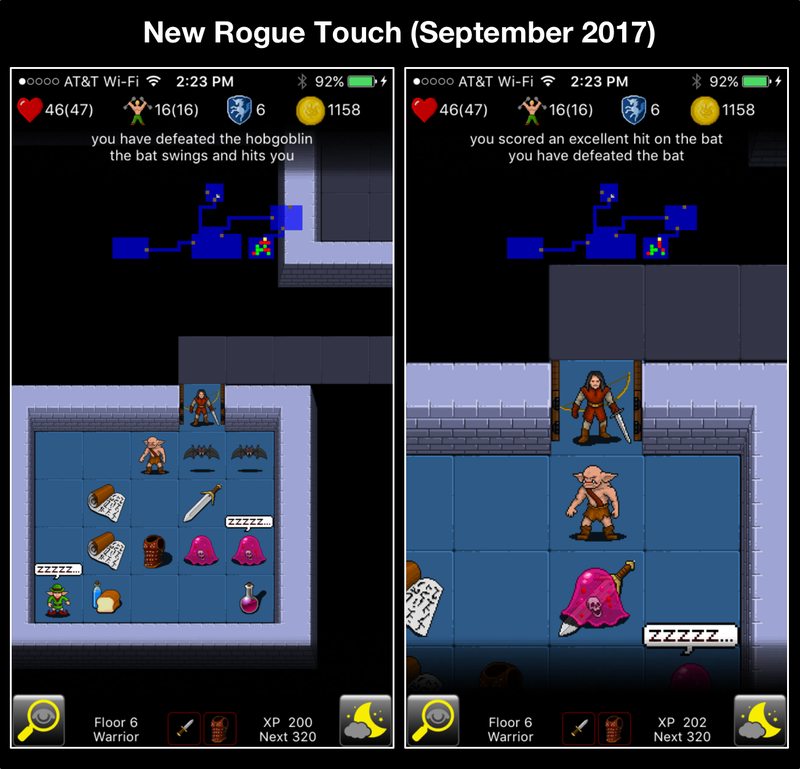 Rogue Touch Version 2.0 should keep us all exploring the dungeons of doom for years to come. Some great things have happened recently. The mission to streamline my budget and reduce debt has reached an important milestone this July, and an unexpected RPGReload article showed up on TouchArcade about Rogue Touch! That frog was me, and the water temperature represents my monthly expenses that slowly went up every year of adulthood (lifestyle creep, business, and my prior marriage were contributing factors) without me really noticing or trying to do anything about it. Believe it or not, up until recently I needed to pull in well over $10K per month just to tread water (very hot water for this poor frog)! That’s not including attempts at saving for retirement or a rainy-day fund, but simply to cover all the monthly bills. It would have been financial suicide to go full indie-game-dev under those circumstances. What does this mean for the future of ChronoSoft? I’m not 100% “Financially Independent” yet but I do have enough savings to smooth any bumps in the road. In the meantime I still plan to do some industrial automation consulting to cover my now modest lifestyle. The difference today is I am in a position to say “no” to some projects, giving myself the freedom to dive into Game Development properly for the first time since 2009! Next post will be finally be new discussion of my upcoming games… and some reflection on the great people I’ve had the honor to interact with during my design phase, as well as you all in the community here and at TouchArcade. Thank you all for reading, playing, and waiting patiently for more! Continuing some of my financial and life balance efforts hinted at in Part 1… In a nutshell, it is likely you will never become a successful indie developer without first gaining control of your budget, savings, and personal “consumption” tendencies. With this in mind, during November and December of 2014 I loaded up a backpack and spent some time in Asia. Not for vacation purposes from the cold arctic tundra of my Northeastern US lair, but rather as a continued trial of ideas for my upcoming indie life. In my spare time I have been learning that traveling the world does not have to be expensive at all, in fact it can be even cheaper than living in a normal home back in the USA! This odd revelation has been fostered by the internet and a variety of computer technology available in the 21st Century, giving rise to “Digital Nomads” – people choosing to live and work somewhere far away from their more expensive home-country. The lifestyle works for those who do not need to report to an office, can do everything with a laptop, and don’t need the usual trappings of western comfort (unfortunately including high speed internet!). If you absolutely must have your fancy craft-brews, wines, cheeses, steaks, 5 star hotels, 25Mbps+ internet, and a big house full of “stuff” then this is not for you. Digital Nomad game developers are rare as far as I know at the moment, but the idea is not without precedent. @Cytoemos on Twitter pointed out that Sarah Northway and her husband Colin have lived this life since 2010 while working on their post-apocalyptic game series “Rebuild”. Having traveled through many countries in the last five years, they are in South Africa as of late 2014. If they can see the world, live cheaply, enjoy life, and have a moderate level of success, maybe I can too! If anyone reading this knows of other successes like Sarah (or any possible failures) please let me know in the comments or via @ChronoSoft on Twitter. Why target Asia for my Nomadic test-run? I have always had an interest in cultures and people from all over Asia (that influence should be obvious in the samples of Spirit Hunter Mineko I’ve shown so far). The economies and climate of the SEA region are also favorable to aspiring Nomads like myself who would like to escape low temperatures and high costs. Fortunately my interests allowed me to blend in seamlessly. OK, maybe not seamlessly… I certainly drew a lot of stares! But I was quite comfortable. I am on the right on track. Just need to stay on the train a bit longer! Today is something unusual for the blog: I’m going to share a bit of the business side of game development, including some never before released sales numbers! As you probably know, Rogue Touch was released in early 2009 when there were only 30k apps available for download. It’s still a solid and fun game, but certainly nothing press-worthy in the million-plus sea of apps in 2014. After all this time it reached a big milestone in early October: surpassing 25,000 copies sold. This would be cause for great celebration… if it hadn’t taken 5 years, 7 months, and 14 days after its original release in the App Store! Over half of all those purchases occurred in the first year of Rogue’s life, especially during the sale I conducted while featured by Apple. RT followed the traditional early spike, rapid decline, and “long tail” that has become common to see in app sales discussions. It has never gone “free”, and has spent vast majority of the time at $2.99. A small trickling average of 2 or 3 purchases continue daily, with an occasional larger spike in sales, and the odd “zero-day” as well. I’m grateful for the moderate success my ugly-duckling version of Rogue has seen, considering the hugely competitive environment in the App Store. However, you may have noticed the problem I face going forward: an average of 2.5 copies sold per day gives $5 per day (after Apple’s 30% cut), or about $150 per month. Without another source of income this is certainly not enough to live on while trying to become a full time indie developer! This bleak reality is the one that 99% of mobile game developers face today. Rather than choose one option, I am pursuing both (and more): Saving every dollar possible from my consulting business while I aggressively cut down debt & expenses, and adding some secret sauce- selling off most of my possessions and preparing to live a nomadic lifestyle! The idea is to reach a critical mass of investments and savings, then quit automation consulting and move into game development full time… a combination of early-retirement & career-change. In theory this will cover my lowered monthly expenses while I devote my time to increasing app-related income. I devised this plan after reading various “Financial Independence” blogs. If you’re interested in that topic try starting with Mr Money Mustache. He has some great articles that will get you thinking about your own money, work / life balance, and happiness. The good news is this approach will give me something that many full-time indie developers don’t have: a safety net. Efforts made today should allow me to work on all sorts of new ideas and games in the future without the fear of ending up homeless/destitute (due to low sales) within the first few years of my indie-adventure. Hello everyone- a small update for you: If you’ve been around getting frustrated by the issues with the ChronoSoft forum this year, know that I feel your pain. My web host unfortunately broke a lot of things when they forced new versions of PHP and mySQL on me. Forum logins were fixed recently, but posting was still broken. I put on my Web Developer hat today (one of about 50 hats you need to own and wear proudly as an indie developer) and dove in headfirst to figure this out. You will be happy to know that I have managed to fix all the remaining issues that I can see so far! If you have trouble with logging into your forum account, please request a password reset and follow the instructions you get via e-mail to reset your account. I believe the updates have increased security but broken the old password system. If you haven’t been around for a while, please pop into the forums and post a hello or reply to my “Logins and Posting” announcement there. Feel free to try to PM me in the forum as well, we need to shake out everything. Hopefully I’ve fixed things just in the nick of time… with iOS 8 released yesterday and new iPhones arriving tomorrow, it would be good to have a place to discuss any issues of note! What’s this? Two posts, in the same year? Madness! As mentioned in my New Beginnings post- I’m gearing up for game development to become more and more central to my life, so this blog and my twitter account ( @ChronoSoft if you’re not already following me ) should be much more active than before. Everyone’s heard about the new iPhone 6 and 6 Plus by now. Many are excited for the possibilities of larger screen gaming, but some developers have concerns about games looking less than optimal on the new phones. I fall somewhere in the middle of these two camps. Why? I like my pixels crisp, with lines so sharp you can cut yourself on them! That may be a problem with the new iPhones coming out next week, especially for games that do not get updated. Both the iPhone 6 and 6 Plus will upscale existing apps to fit the new screen space available to them rather than show black bars as older iPhone apps would do on the 5, 5s, and 5c. Your older apps and games will believe that they are running at 1136×640, but the content is being stretched to fit either 1334×750 (on the 6) or 1920×1080 (on the 6 Plus). This means every game in the store will need updating in order to avoid this undesirable effect. The iPhone 6 Plus actually has a second issue. In a nutshell the screen is rendered at 2208×1242 and then down-sampled to fit 1920×1080 (note that this is exactly how the Retina MacBook Pros operate). This will have the effect of subtly softening and blurring things, even when running native iPhone 6 Plus apps! I’m not yet sure if this will affect OpenGL or “Metal” drawing APIs. If it does, pixel art fans will notice the difference, and many will be unhappy. Now, all may not be lost… I’ve not yet dug into the latest XCode and iOS SDK to see if we can target pixel-perfect 1920×1080 resolution with OpenGL drawing on the iPhone 6 Plus. It seems this should be possible, especially because 3D games usually need the extra rendering performance that could come from drawing at “only” 1920×1080! I was tempted to buy an iPhone 6 Plus to dig into the problem first-hand. However, after testing their relative sizes with cheap cases I got from Amazon, I decided to go with the 4.7″ iPhone 6 as it was more reasonably sized for my hands and pockets. iOS 7 – Rogue’s End? Well, not exactly… But Rogue Touch has had a pretty long and healthy life in the App Store. These days its aged appearance is not doing it any favors, and good grief man, my old code is horrible to look at! iOS 7 and a new round of hardware (likely new iPhones and iPods) will be unveiled tomorrow at Apple Headquarters in Cupertino. Rogue Touch has run on every generation of hardware and every version of iOS since 2.0… But patching it up to support newer OS and hardware correctly is frustrating. Since I was a novice to iOS and Objective C back when I created RT, I did a lot of unspeakable things in the code that are facepalm-worthy today. People who follow me on twitter may be aware, there’s a small gotcha coming when Apple releases the latest version of iOS. When you update to iOS7, the “Greetings, Rogue” popup no longer allows you to enter a name, so you are temporarily stuck with whatever name you last made a run with in iOS6 as your default, or with “Rodney” on a fresh install! I am in the process of fixing this, and attempting to maintain compatibility back to iOS4.3 (or roughly in that era). This will near-definitely be the last update to Rogue Touch as you know it. However, the next generation of Rogue is well into production and will be unveiled on a very special date! Additionally, there is an incredible amount of neat stuff to talk about with Spirit Hunter Mineko, and my future development plans. Recently I was searching for a few more dungeon generation techniques and some AI articles to get ideas for enhancing Mineko, and stumbled across Phi Dinh’s work in these areas… he has written articles and created a few videos on these topics while working on his vision for TinyKeep (really worth checking out if you’re technically minded!). As it turns out, TinyKeep is a realtime dungeon crawler with some neat procedural dungeon generation, and lots of clever AI. Or at least it will be when it’s done! This is where roguelike and dungeon crawler fans need to come to the rescue… Phi has only a few days left for his TinyKeep Kickstarter and could really use some love and support from the community. I’ve donated to his Kickstarter cause already, and hope that some of you can help by donating as well. Phi’s a great guy with some really smart ideas, I would love to see him succeed with TinyKeep.